The 20th century witnessed a lengthy battle between polar opposite views of how to organize and regulate economic activity. Although free market capitalism won that epic struggle decisively, it failed to capture the minds of intellectuals and the hearts of citizens. Corporations are probably the most influential institutions in the world today and yet many people do not believe that they can be trusted. Conscious Capitalism is a philosophy based on the belief that a more complex form of capitalism is emerging that holds the potential for enhancing corporate performance while simultaneously continuing to advance the quality of life for billions of people. Today’s best companies get it. From Zappos to Whole Foods, the Container Store to Google: they’re generating every form of value that matters: emotional, social, and financial. And they’re doing it for all their stakeholders. Not because it’s “politically correct”; because it’s the ultimate path to long-term competitive advantage. Conscious Capitalism differs from Corporate Social Responsibility (CSR) by virtue of its origins from within the company as an expression of an overall perspective on how to conceive and build a business, rather than as a response to external notions of what counts as “socially responsible” or external pressure. 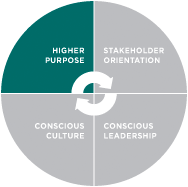 Conscious businesses are explicitly managed for the simultaneous benefit of all of their interdependent stakeholders, including customers, employees, investors, suppliers, and the larger communities in which the business participates. 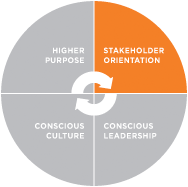 Stakeholders comprise an interdependent and interrelated system, recognizing that by creating value for all of the stakeholders (in various and often differing ways) the whole system advances. 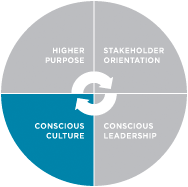 Driven primarily by service to the firm’s purpose, and focus on delivering value to the stakeholders, Conscious Leaders adopt a holistic worldview that moves beyond the limitations of traditional machine metaphors for business. They view their enterprises as part of a complex, interdependent, and evolving system with multiple constituencies. 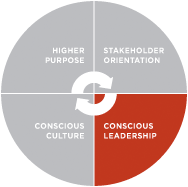 Conscious Leaders see that profit is one of the important purposes of the business, but not the sole purpose. Most importantly, they reject a zero sum, trade-off oriented view of business and look for creative synergistic win-win approaches that offer multiple kinds of value simultaneously to all stakeholders. Captured in the acronym TOUCH: Trust, Authenticity, Caring, Transparency, Integrity, Learning and Empowerment, the word tactile also suggests that the cultures of these companies are very tangible to their stakeholders as well as to outside observers; one can feel the difference when walking into a conscious business. Kurt. Peter Drucker would argue that this is a return to something he called ‘salvation by society” in which reached this situation businesses were built with an inherent view of enhancing “we the people” societally through a profitable business. In his 1999 book, The New Realities, he outlined his concerns that businesses of the 90’s were losing sight of this and I wrote an article not too long ago suggesting that businesses were now ‘bolting on’ social responsibility … but in the end Drucker was quite correct in New Realities … business was moving toward dollars & cents and away from values . It is a much longer discussion but today we discuss being in a recession I would suggest that we reached our economic situation through a combination of fiscal decisions and societal values ‘recession’ and that to solve it businesses, and people in general I imagine, need to wrap their heads around what you are calling ‘conscious capitalism’ and Drucker called “salvation by society.’ Regardless. Good thought Kurt. Thanks for the comment and additional insight. Whatever label people want to use, I believe the macro trend taking place in American business today is the transition from the “Greed is Good” 80’s and 90’s to the Age of Meaning in the 21st Century. Thanks Liz. Appreciate you reading my meandering thoughts. Thanks for your comment. As a matter of fact, universities have the most ripe offerings for social enterprise in the country. There are so many venues. One in particular is Students in Free Enterprise (SIFE) (www.sife.org). There are over 600 chapters around the country. In fact, I’ve been assisting the SIFE team here in Nashville at Belmont University to develop a social enterprise called Spring Back Recycling (www.springbackrecycling.com) where they’ve developed a concept that prevents throwing discarded mattresses into landfills. Instead, they work with companies to accept those discards and then disassemble the mattresses, and then separate the component parts and sell them for scrap. That’s the obvious environmental component. The best part is that this business employs “broken and disenfranchised men” who are recently been released from prison and working themselves back into self-sufficiency. The business makes a small profit, employs and rewards people who are thankful for the work and training, while improving the environment. Truly the triple bottom line!